Unlock and untangle their shoulders. You may be able to eliminate your shoulder pain just with the Shoulder Pain Solved program you ordered a few minutes ago, but if you’re like some of the clients I’ve helped, you may need to unlock and untangle your shoulders too. 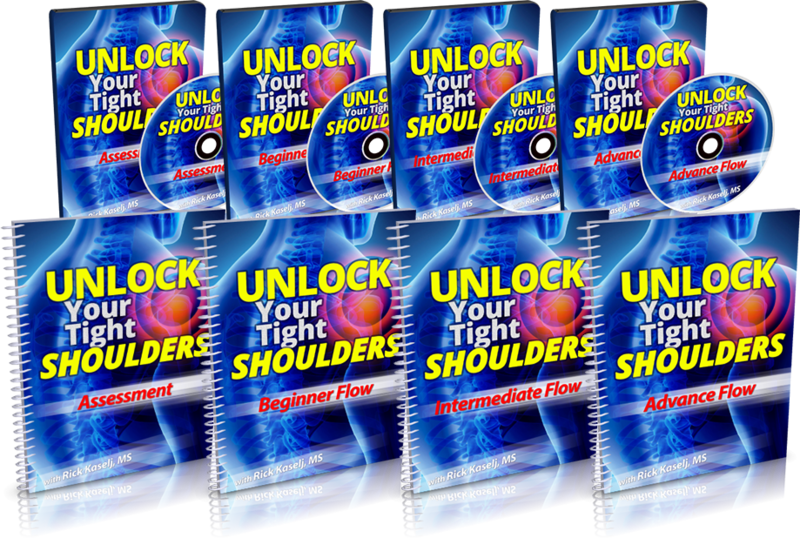 If you add my Unlock Your Tight Shoulders program to your order right now, you’ll get it for 82% OFF the normal price of $57 - you get it for just $10! But this one-time offer expires right when you leave this page, and will never be available again! So DON’T MISS IT! ...so you can have all of my best shoulder pain tools and resources at your disposal! Why does Unlock Your Tight Shoulders work so well to unlock and untangle your shoulders? This program utilizes a unique shoulder reshaping method, using 8 “modalities” that are executed with gentle movements and exercises that only take a few minutes a day. This reshaping method has been proven to unlock and untangle even the most knotted shoulders. What exactly do you get with the Unlock Your Tight Shoulders program? In this first video, I introduce you to the program, give you a quick tour of everything included, and provide the basic education you need to understand your shoulders, and what exactly we’ll be doing to heal them. In this next video, we’ll do a full assessment together so you’ll know exactly where you stand, and which “flows” and “sequences” you should use in the next section. There are six “flows” and “sequences” videos in total - two videos for each fitness level. The fitness levels are Beginner, Intermediate and Advanced, and for each level there is an Instructional Video and a Follow-Along Video. With my help, you’ll know exactly which videos to use for your particular situation, so you’re fully protected, and can maximize your results in the shortest time possible. You also get a PDF Guide - a detailed written guide with pictures that you can print out and even bring with you on the go! Don’t miss this opportunity to get all my best shoulder pain tools and resources for such a low price! No thanks, I will pass on this ONE-TIME OFFER for now… and I realize I will NEVER have this opportunity again.